I love glitter polishes but creating fabulous nail art out of them can be a major task. 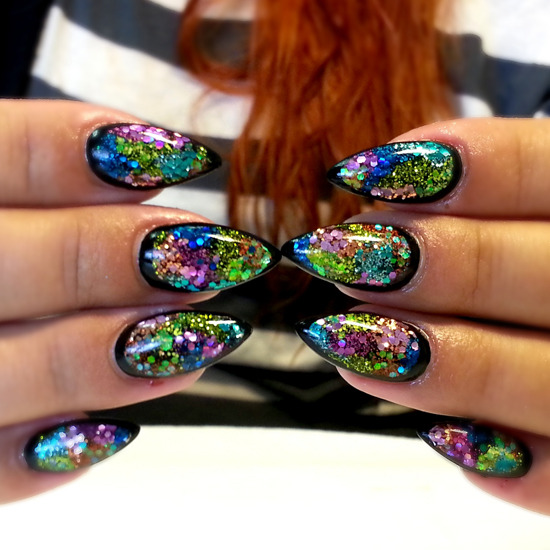 While going through a number of different nail art ideas, I came across to this fabulous one. You can’t resist this sort of sparkle! Micaela Wallgren of Svea Naglar in Sweden takes us step-by-step through the creation of this lavish manicure using the newest Light Elegance collection of gels. See it by scrolling down! Step 1: Start by applying Light Elegance Black Art Gel over the nail; cure. Step 2: Apply a bit of each color of the Light Elegance Textured Neon Glitters. Just dab a bit here and there until the nail is entirely covered; it doesn’t have to be perfect. Cure. Step 3: Sculpt the nails with Light Elegance 1-Step Clear Gel and cure. Step 4: Buff the surface. Now you need to outline the art. Draw a black frame around the nail with black Polycolor acrylic paint. Step 5: Get the shine with Light Elegance Top Gloss and cure. Finish by softening the cuticles with Camilla of Sweden Nail Drops. You can also try them with a white background! Ohh such gorgeous nail art!